We accept visa and mastercard via paymate express, paypal, direct bank deposit, money order and personal cheques. Note: personal cheque requires 3 - 4 days to clear, money order will be processed straight away. Digital Video Cameras and Camcorders or Handycam. Here are some terms that are frequently used with digital video cameras. Have a quick read to give you an idea on what kind of digital video camera is best suitable for the type and style of video recording or movie you want to create. All video cameras incorporate an autofocus (AF) system. This enables the video camera to choose the most obvious subject, it measures how far away it is, then moves the lens elements until the light rays from the subject converge on the CCD. The subject then becomes sharp. Some AF system are more clever than others. They lock on to a particular subject, so that if a person walks in front of the subject, the focusing system ignores them. This is the highest resolution form of high definition television (HDTV) using 1080 lines interlaced. This is the highest resolution form of high definition television (HDTV) using 1080 lines progressive scanned. This is a lower resolution form of high definition television (HDTV) using 720 lines progressive scanned. Blu-ray is an optical disc format just like CD and DVD. It is for recording and playing high-definition (HD) videos. A CD disc can only store up to 700 MB of data and a typical DVD can only store 4.7 GB of data, but a single Blu-ray disc can store up to 25 GB of data. Even a double sided, dual layer DVD can only store a maximum of 17 GB of data. Dual-layer Blu-ray discs are able to store 50 GB of data. That is around 4 hours of HDTV. Acronym for Charge Coupled Device. CCDs are the sensors used in video cameras that makes them able to record moving images. The CCD sensors captures light and then converts it to digital data. Some digital video cameras use three of this sensors, one sensitized for each of the primary colours red, blue and green. You can see them labelled as 3CCD. Acronym for Digital Video. it is a recording format and codec used by many digital video cameras. Firewire is the name given by Apple to the standard IEEE 1394 interface and communications system. It is the standard connection used between DV camcorders and computers. It is a bi-directional link that allows data to be passed to and from computers. Later computers usually comes with a Firewire input and if not you can get a Firewire card installed. MiniDV is a video tape cassette and also a recording format type usually used for consumer video cameras. Professional systems can use a full-size DV video tape cassettes. Every video camera boasts a high speed shutter, a term borrowed from still photography. (Still cameras have shutters that open to allow light to fall on the film or CCD). Video cameras don't have shutters. When the video camera is switched on, light falls on the CCD continously, but the CCD doesn't constantly record an image. Recording occurs only when the video camera supplies the CCD with an electrical charge, in other words when you press record. Fields and frames- Like a television screen, the CCD is made up of a number of horizontal lines. In some countries like australia this number is 625(PAL), in others like USA is 525(NTSC). The video camera only supplies a charge to half of these lines at a time. It alternates between supplying a charge to the odd and even number lines. Each of this half images recorded by the CCD is called a field. Two fields, one of odd number lines and the other of even, are interlaced to form a frame. Each field is a snapshot of the action at a given moment. If the shots are played back fast enough, the brain sees a moving image. Fields per second- In australia where the standard for television screens have 625 lines(PAL), the CCD records 50 fields per second. With TV's that uses 525 lines(NTSC), video cameras record 60 fields per second. With a 1/50 sec shutter speed, each charge supplied to the odd or even lines lasts for 1/50 sec. The CCD records an image continuously, as 50 fields are recorded a second. With a high speed shutter, such as 1/1000 sec, each charge is supplied for only 1/1000 sec. As there are still only 50 charges per second, there are gaps of 19/1000 sec between each field when no image is recorded. When you play back a moving subject recorded with a high speed shutter, these gaps cause it to move like someone under a strobe light. With a high speed shutter, each field is blur-free, because most subjects hardly move in so short a time. Played back in slow motion each frame can be seen clearly. This is ideal for analysing action, such as your golf swing or tennis serve. To see SHIPPING COST, Add products to shopping cart. 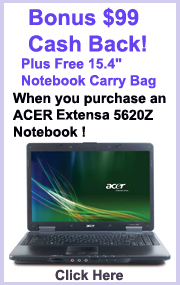 - Acer Aspire One - AOD150 10.1 inch Atom 1.6Ghz + $79 Cash Back! At TreatYouGoods.com we offer you lots of varieties on imported and locally sourced Digital Cameras and Video Cameras, we give you chance on products that will not even be released here in australia. All of our Laptops and Printers are all locally sourced and whatever the manufacturer promotion offers such as cash backs and free gifts are all covered. •All products and brand names on this site are trademarks or registered trademarks of their respective companies •All prices are in AUD unless it is stated otherwise.